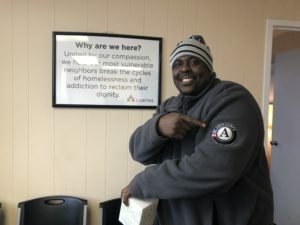 AmeriCorps Spotlight: Kelvin Batts - CARITAS - Shelter. Jobs. Recovery. Hope. What that means: I work alongside the warehouse supervisor to pick up donations to be used in our furniture bank, delivering furniture to our client’s homes, and sort donations as they come into our warehouse. In addition, we set up the warehouse floor for the clients, organize the inventory, assist with truck drives with congregations, and engage with the community at local volunteer events and festivals. Background: I am a native of Petersburg, VA where I graduated from Dinwiddie High School and then later became certified as a forklift operator, skid steer operator, backhoe operator, and cherry picker operator, and I have a background in construction. I became familiar with CARITAS through community service requirements and was able to start as an AmeriCorps member once my requirements were met. Hobbies and Interests: I love watching football and I am a die-hard Cowboys fan. I enjoy playing sports such as basketball and football. In addition, I enjoy fishing, shooting pool, and cooking. I’m interested in trying different foods and finding new recipes I can try out in the kitchen! I most want to visit: I would love to one day go to Africa because I am interested in learning about different cultures, going on a safari, and going sightseeing. Favorite Place I’ve Lived: I loved when I lived in Petersburg in the early nineties because the town was lively, the parks were always full, and friends were always around. The atmosphere was always happy and everyone was in good moods. I Can’t Live Without: My family. My mom and sister have always been supportive and have always been my backbone. They help me to strive to be a better person each day. Best Part of My Service Position: I love the opportunity to give back and seeing the smile on a kids face who is getting a bed for the first time. It’s wonderful to give to people that haven’t had such things before.